Goss Chiropractic Clinics are the “gold standard” in chiropractic care. They have earned a reputation for outstanding wellness care and pain relief during 23 years of service to the community. Many people seek chiropractic care because they are experiencing back or neck pain. At Goss Chiropractic, doctors uncover the underlying cause of your health problem, develop a plan to relieve your pain as quickly as possible and determine ways that you can participate in your recovery. 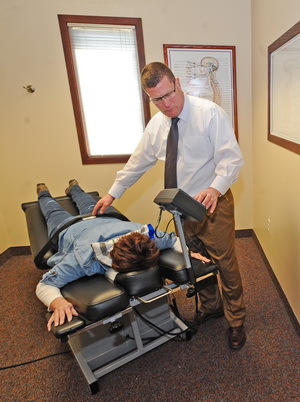 Goss Chiropractic offers Spinal Decompression Therapy for patients with herniated discs. “Many of our patients who were scheduled for back surgery sought spinal decompression as an alternative and were able to correct their problems through therapy and ultimately cancel their surgeries,” said Dr. Goss. The clinics also boast a Generation Four Laser for treating sports injuries to the elbows, knees, and wrists. The high-tech equipment speeds healing for sprains, strains and soft tissue injuries and reduces pain for arthritic knees and joints and spinal conditions. Their Generation Four Laser is the same unit used by the New York Yankees and New England Patriots sports teams. “The expense of the Generation Four Laser is prohibitive for many practices. We are very pleased to be able to provide access for our patients,” said Dr. Goss. He explained that some older generation lasers are less expensive but not as effective. The clinics are open until 7 p.m. weeknights, offer Saturday hours and remain open during lunch for convenient appointment scheduling. Visit the Sterling Heights office at 5600 Metropolitan Parkway, just west of Mound Road.